In the wake of Boston-Mayor-for-Life Tom Menino’s death, there will be . . . ads. 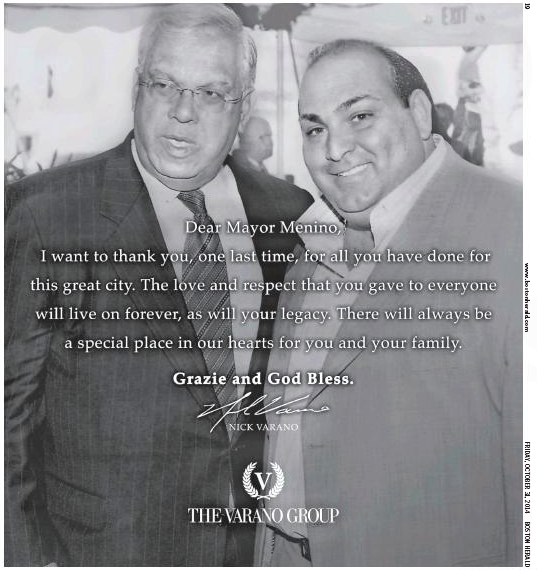 First out of the blocks, though, is one Nick Varano, who ran this full-page ad in yesterday’s Boston Herald. And this half-page ad in the Boston Globe. 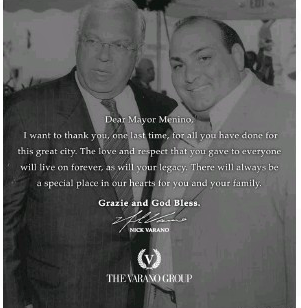 So who, exactly, is Nick Varano? Plug him into the Googletron and you get this. UPDATE: Actually, no tribute ads in today’s locals. Check again tomorrow, yeah? This entry was posted on Saturday, November 1st, 2014 at 12:00 pm and is filed under Uncategorized. You can follow any responses to this entry through the RSS 2.0 feed. You can leave a response, or trackback from your own site. 2 Responses to Who Is Nick Varano?